New Delhi: With numerous medical colleges failing inspections on the grounds of infrastructural and organizational deficiencies, the Medical Council of India (MCI) is mulling over to revise its policy to provide its permission only to those medical colleges which have a functional hospital for a span of at least three years. The Indian Express recently reported about data of NITI Aayog, in view of which the MCI is expected to take the decision. As per the rules stipulated by the MCI, a medical college with 100 seats mandatorily should have a functional teaching hospital with a capacity of at least 300 beds, with 60% occupancy during the time of submission of an application to the apex medical regulator. The 60% bed occupancy is required to be maintained at the time of the annual renewal the next year. The bed strength has to increase to 500, with a minimum 75% occupancy, at the time of the second renewal. However, out of the 89 medical colleges that were approved in 2011-2018, 39 failed to clear inspection by the apex medical council. In most cases, the functioning of the hospital was found to be “deficient” whereas many were found to be facing faculty shortage and weak bed capacity, revealed the data available with the NITI Aayog. As apparent from the data, the MCI saw that the new medical colleges are facing problems in running hospitals. As these institutes focus more on the education front, running a hospital never becomes a priority, it noted. 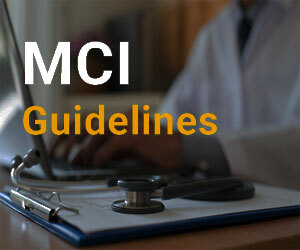 Taking the above into account, the MCI is now considering the option of restricting new medical colleges to institutions which have a functional hospital for at least three years, reports The Indian Express. “It is clear from the fate of the new medical colleges that the real problem is in the running of the hospital. That is where most of them slip up, because, for a medical college, running the hospital is never a priority, partly because all the investment is done on the teaching side of the business. That is why we are looking at upturning the rules and allowing new medical colleges only where a hospital has been running for three years for more. This would, in essence, mean that only existing hospitals and chains would be eligible to start new MBBS programmes, especially in the private sector,” source informed Indian Express . Private medical colleges usually get income from students and not from patients of hospitals attached to it. If there is a hospital without proper facilities or qualified and competent staff, no patient dares to go to that hospital. Even today if MCI inspections are even 50% strict ,I am afraid most of the private medical colleges may not get any recognition. Even today, most government medical colleges where treatment is free have enough number of patients.The main allegation against many private medical colleges is that they are not ready to provide any service for free. If any medical college management manages to get all recognitions and running postgraduate and superspeciality courses in all specialities without required number of patients or regularly working teaching medical faculty, it is wrong to blame the MCI alone as the central health ministry is also equally responsible for its inaction. In India, currently there is no shortage of qualified doctors but there is severe scarcity of competent doctors. Medical education is a social service and cannot be treated as business for exclusive unregulated profit. Meanwhile, the investors and stakeholders should get reasonable return for their investment and Supreme Court has capped this return at 15%. The main issue here is the business sharks roams around in this devine seas with greedy eyes on unlimited profit and this is the beginning of the end of every medical College in private sector. If Kanachur Institute of Medical Sciences at Mangalore can dupe the regulatory bodies to make unbridled profit, everybody can do anything here…! MCI should make sure that private colleges should pay their faculty, other doctors and staff gets their salary every month and in proper fixed time. Yes,in most medical colleges salary not given in time.